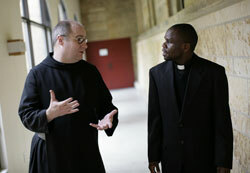 Saint Meinrad School of Theology in St. Meinrad is the place where the vast majority of archdiocesan seminarians receive the last four to six years of their priestly formation. When a major change happens in the life of the Benedictine-run seminary, it will potentially have a significant impact on parishes across central and southern Indiana as well as the archdiocese as a whole. Such a change is happening. Appointed last January, Benedictine Father Denis Robinson is this month taking the helm of the seminary as its new president-rector. He succeeds Benedictine Father Mark O’Keefe, who had led the seminary since 1996. In a recent interview with The Criterion, Father Denis talked about his new duties. Q: Being responsible for the priestly formation of men who will serve as priests in dioceses and religious houses across the country and in various places around the world can be seen as a daunting or humbling task. Do you see it in that way? A: I certainly see it as a great responsibility. And I certainly have enough of an understanding of the significance of the priesthood to know that these men will have a tremendous impact on the lives of the people they will be serving around the world. And so it’s certainly a task that you have to take very, very seriously, and one which is certainly subject to a great deal of levity at all. You really have to give it quite a lot of thought. It’s a great responsibility. … To be the president-rector means that you have the final responsibility. It’s your name that will go on all of those evaluations. It’s your name that will go on the endorsements that are sent out to bishops and religious superiors for ordination. And, ultimately, you’re the one that’s responsible for making sure that these candidates are well prepared and the best possible candidates. Q: What do you think are the opportunities and challenges that seminaries, and maybe Saint Meinrad in particular, face in forming young adult men—those born well after the Second Vatican Council—for the priesthood? A: There’s an amazing zeal in younger Catholics today that is certainly noteworthy. There is a great deal of focus on the practice of their faith. And they certainly see being Catholic as something that’s distinctive and important for them. So they tend to really identify with their Catholic faith and they want to be able to be a part of that, whether it is as a priest or a religious or as a married person. I think younger people today who are involved in the Church are much more likely to consider a religious vocation than, perhaps, young people of a generation before. The other thing is, they are very community-minded. They want to build communities. They’ve kind of looked around at the culture from which they’ve come and seen the effects of isolation and the whole suburban mentality of individuals that are on their own. And they really do see the importance of building community. And they want to do that. And so that’s a real plus because a lot of what we do in terms of formation is helping people learn to be community builders, to be interdependent and find ways to effectively build community. The opposite side of that is that, sometimes, young people today—and this would be true at any time—can very much be affected by their cultural background. That is to say, they can be very much inundated with a pop culture mentality. And although they have a great desire for it, understanding permanence as a real concept is something that has a real lived responsibility attached to it can be a challenge. We live in a generation—and it’s not just young people, it’s everyone—that is very much used to moving on to the next thing and constantly kind of seeing a turnover. And so challenging our young people, who are very devoted already, to seeing vocation to a lifelong commitment is important. But, of course, that has implications in marriage as well as in the priesthood and religious vocations. Q: You worked closely in the past with you predecessor, Benedictine Father Mark O’Keefe, as his executive assistant and as director of continuing education. How do you think your experience of his leadership will help you as you begin your own? A: Certainly Father Mark, for many years, even before coming to Saint Meinrad to work, has been an influential figure in my life. He was my spiritual director when I was a seminarian. And so I’ve always looked to Father Mark as a kind of ideal for the priesthood and for leadership and now, of course, for monastic life. I think one thing that Father Mark has really done and really shown is the importance of relationship in terms of leadership in seminaries. In other words, fostering quality relationships with faculty, with students, with benefactors, with bishops, and using that as the real guiding mechanism for moving the seminary forward, for moving the programs of priestly formation forward. The other thing that I think Father Mark has done that is really remarkable is his vision and it’s certainly my kind of vision: that we’re preparing people today—men for the priesthood, people for lay ministry, deacon candidates—to minister in a Church that’s five years in the future. So we cannot be reacting to even to the situation of the Church today, much less operating out of a model that was effective five or 10 or 15 years ago. The Church five years from now is going to be a very different Church from what we’re experiencing today. And we have to be preparing people to minister in that Church. So having that forward-looking vision is a key to the successful outcome of what we do as we prepare people for ministry. Q: At the same time, besides the forward-looking perspective that you take, which is, as you said, a very important thing for us to do, you’re a person who loves and is very much rooted in the history of the Church. Q: So, how is it important for men being prepared, especially for the diocesan priesthood, to be rooted in that long tradition of the Church in order to be able to minister to that Church five years in the future? A: I think the key, as you say, is that they must know the Church’s tradition. They must know its history. They must know its spiritual tradition. They must know its theological tradition. And that must be deeply rooted in them. That’s the real task of the priest—to hand on the tradition from one generation to the next. So in order to hand that on you have to be able to articulate it. You have to be able to communicate it. And you have to know it. Why is that important? Because that’s what people need. They need the stability of the 2,000-year tradition of the Church. They need the foundations, the solid foundations, which those theological traditions, those spiritual traditions, those cultural traditions provide. The Church, in a phenomenological way, is rapidly changing. We see the demographics of the Church changing. But the essence of the Church never changes. Its foundations do not change. And that’s the real message that we have to preach today. That there is something solid in the world around us that we sometimes see as having no objective truth where there is no such thing as something that lasts. And it goes back to the question of the way we perceive relationships. It touches on almost every aspect of our lives. But we also have to realize that the Church’s tradition is truly Catholic, that it encompasses so many personalities and figures and attitudes and temperaments and perspectives. You can see that across the board in terms of the various kinds of saints, which are very important in the lives of young people today. They provide a very palpable example of the Catholic nature of our Church.